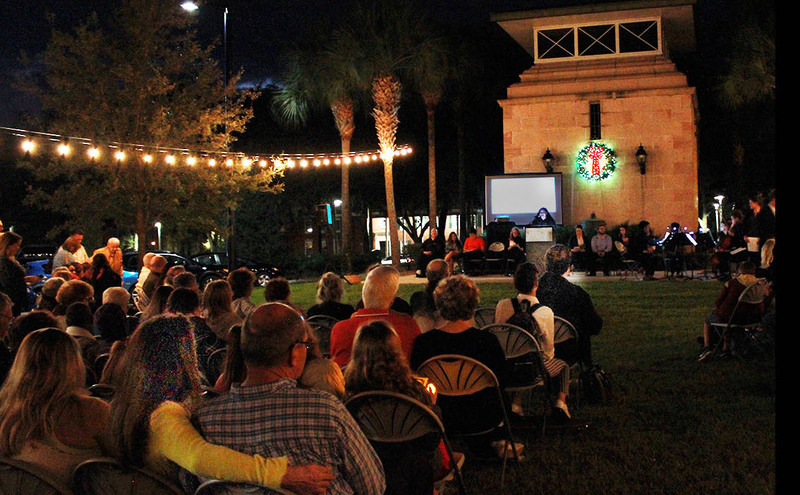 Stetson students, faculty and staff joined together “with stories of hope and songs of faith” on Tuesday night as they celebrated the university’s 70-year tradition of lighting the Yule Log on campus. The yule tradition traces its roots to Europe before Christianity when villagers celebrated the winter solstice by finding a hearty oak tree to burn for light and warmth. Later adopted by Christianity, the yule log burned during the 12 days of Christmas, as families remembered the warmth and light of God’s presence. Whatever remained of the log was stored until the following year and helped light the next year’s fire, said Bria Aqui, Student Program coordinator for the Office of Religious and Spiritual Life. 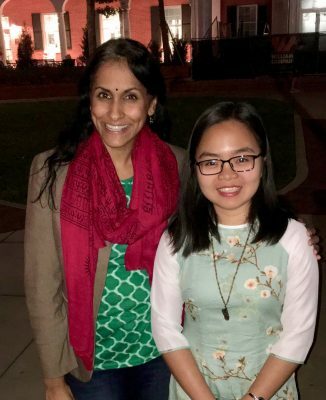 “Stetson University has observed this tradition for 70 years now, as a time to pause from studying for finals, to gather in the holiday spirit with friends before we leave for the winter break, and to celebrate and appreciate our diverse religious customs,” she told the crowd. “… We hope you will enjoy this with us as we join together tonight to celebrate this tradition with stories of hope and songs of faith in the light and warmth of the Yule Log,” she said, adding that a documentary will be made about Stetson’s Yule Log tradition for the 75th anniversary in 2023. 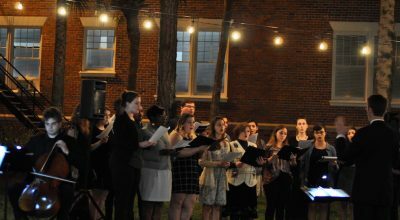 The Stetson Community Choir sang several musical selections, including “Silent Night,” while university chaplains Rev. Christy Correll-Hughes offered the Invocation and Sensei Morris Doshin Sullivan invited the crowd to cast sprigs into the fire, letting go of their burdens from the past year. Tam Pham, president of the Asian Pacific American Coalition, right, read a poem at the ceremony written by Rajni Shankar-Brown, left, associate professor and Jessie Ball duPont Chair of Social Justice Education. 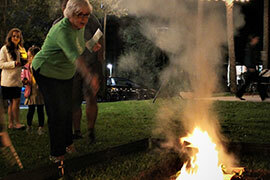 Shankar-Brown said she has participated in the Yule Log tradition each year since joining Stetson’s faculty and this year was particularly special because of the students’ help in leading the 70th anniversary event. “From the global crisis of climate change to widening economic disparities, racial injustice and repulsive violations of human rights, these are troublesome and uncertain times for our world,” Shankar-Brown said.